Hi! I’m Kristin and I’m the creative mind behind Yellow Bliss Road, the place where you will find tons of simply creative recipes, decor ideas and free printables. I’d love to have you drop by for a visit! 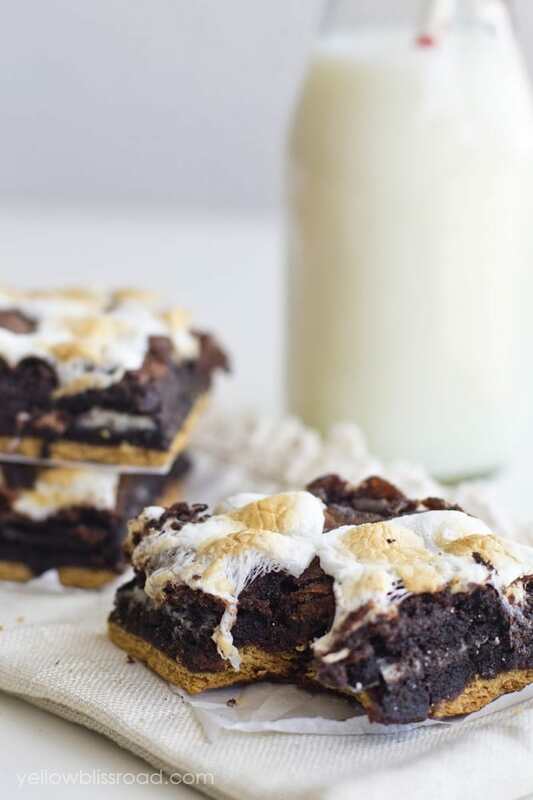 I’m thrilled to be a part of Sarah’s S’Mores Saturdays series (say that three times fast!). I’m got a recipe to share with you that I promise will knock your socks off! I make a lot of treats, and this is the one that I make over and over, because I just can’t get enough. It’s like all of my childhood favorites came together and had a little dance party. I mean, tell me these don’t look AMAZING! Imagine all of the thing that remind you of childhood backyard barbecues and summer vacation all blended together in a fabulous dessert. Sticky S’Mores faces licking the marshmallow off of their fingers, twisting the tops off of the Oreos so you could lick the yummy creme in the center. And brownies. Oh, the brownies. These brownies are super easy to make. You start with a graham cracker base. 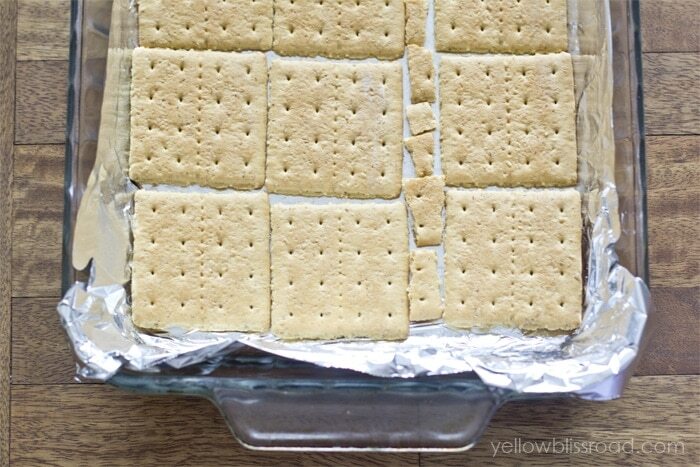 Just line a pan with foil and line up the graham crackers, adding broken pieces to fill all the space. Next you’ll top with half of the brownie batter (you’re using a boxed mix, so just follow the instructions on the back of the box to mix it up) then top that with Oreos. Next you’ll add a cup of marshmallows to the remaining batter and fold them in until they are all covered with chocolate. Then spread that on top of the Oreos. 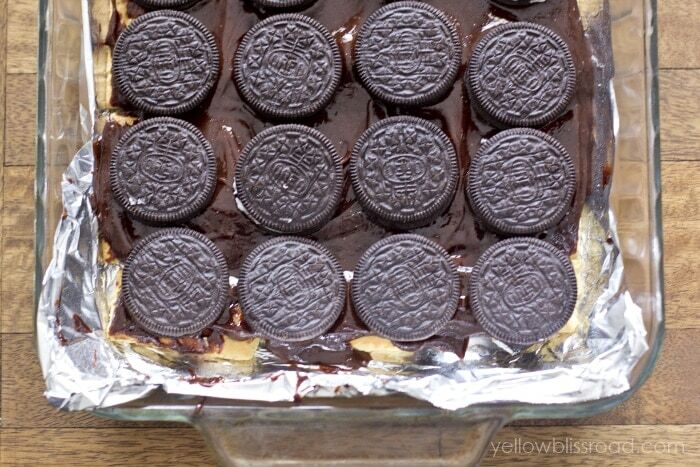 Try to get the brownie batter all the way to the edges of the pan or the Oreos tend to burn. But if there’s a little peeking out, don’t worry, it will still be incredibly yummy! Then bake that beautiful mess for about 27 minutes, on the middle rack of the oven. 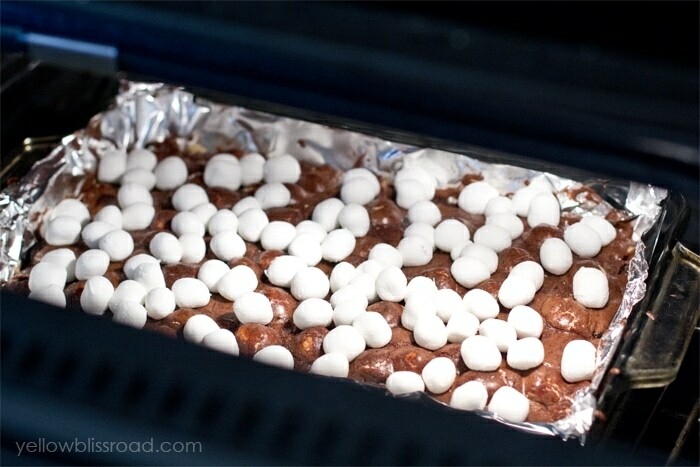 Flip on the broiler and sprinkle another cup or so of marshmallows on top of the brownies. Leave them on that center rack and let the broiler brown them for about two minutes. Don’t walk away – they can burn in seconds! 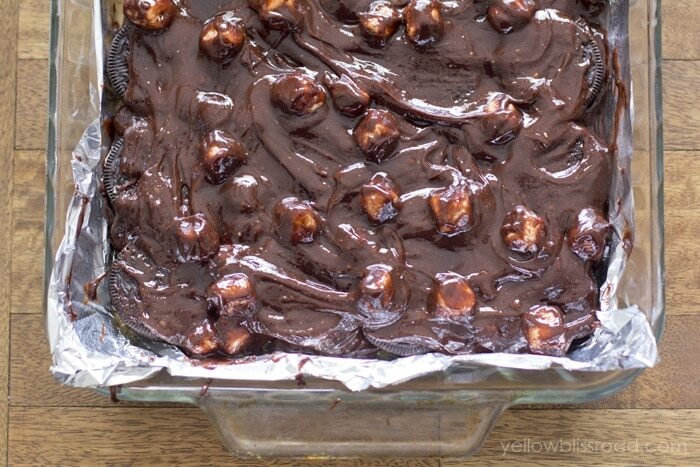 Remove from the oven and allow the brownies to cool completely before cutting into bars. The marshmallow does get sticky so it helps to dip the knife in warm water after each slice. Go ahead and eat them warm – just try not to burn the roof of your mouth! 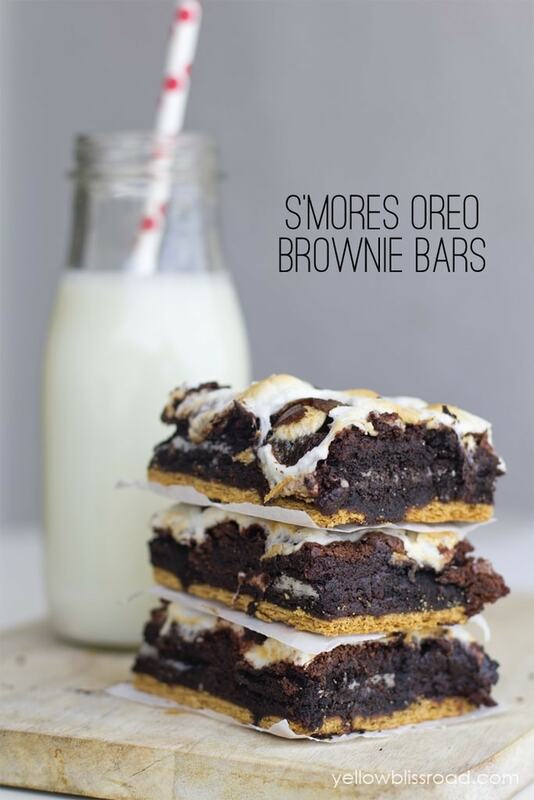 These would make a great gift for National S’Mores Day on August 10, too! 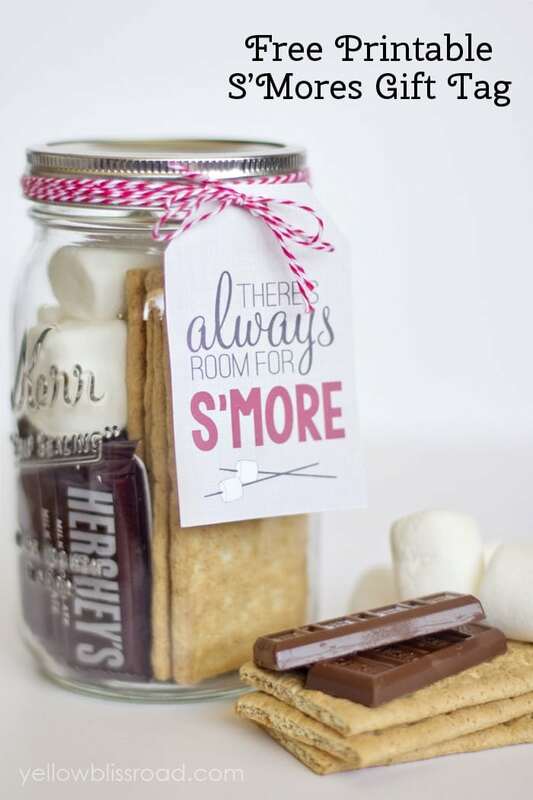 Be sure to grab the free printable S’Mores Gift Tag on my site! Preheat oven to 350 degrees and place rack in the center of the oven. Line a 13"x9" pan with foil and spray lightly with cooking spray. Prepare brownie mix according to package instructions. Place graham crackers in the bottom of the pan, breaking as needed to fit. Pour half of the brownie batter over the graham crackers and spread very gently with a knife to cover. Place Oreo cookie on top of batter. Add one cup of mini marshmallows to the remaining brownie batter and fold in gently. Spread batter gently over Oreos, placing mini marshmallows evenly. Bake for approx. 27 minutes or until a toothpick inserted in the middle comes out almost clean. 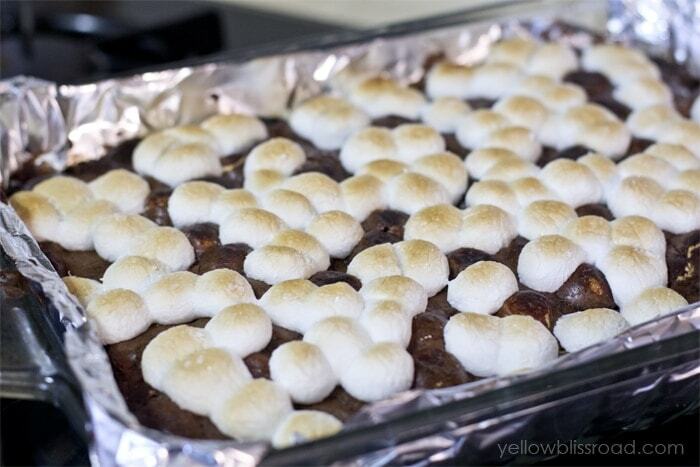 Switch to broiler and sprinkle remaining marshmallows on top of brownies. Place pan back into the center of the oven and leave door cracked open for about two minutes so marshmallows can brown. Watch closely as they can burn quickly! « From Rug to Room . . .